It’s been rainy for the last few days. We can certainly use the rain, though the thunderstorms that woke me up Tuesday night/Wednesday morning were a bit much. It has made cycling a bit trickier. I don’t mind getting wet, but being out in a thunderstorm is another matter. Tuesday I managed to get in a 16-mile ride (including a stop at the Millstone Market in Sunderland for a couple of onions), but 4 miles from home the heavens opened, as I feared they would. It was actually rather nice, since the temperature had been in the mid-80s and it was very humid. I’m not used to that after our cold spring. The rain, at about 70 degrees, cooled me down effectively. I was drenched but happy when I got home. My Zugster handlebar bag and Nigel Smythe tweed saddlebag kept my stuff nice and dry. After breakfast this morning it looked as if I would have a little more than an hour until rain arrived, so I plotted another outing: a 16-17 mile, mostly flat loop (15.7 miles, but with an option to extend to 17). I’ve gotten somewhat faster; a year ago I would have considered 13-14 flattish miles to be an hour’s ride. I had a moderate tailwind for the first half of the ride, and a moderate headwind for the second half, but I still finished 17 miles in only an hour and 5 minutes. It feels good to have improved that much. I got a new beam-style torque wrench last week and installed the cranks, then installed the pedals. A day later I installed the derailleurs and shift cables, shortened the chain to the proper length (2 links longer than recommended, since I will be using the big ring-big cog combination regularly, but not the small-small combo), and got the drivetrain running. Just a couple more steps before I can ride the bike: installing brake housing and cables, adjusting the brakes, tightening the headset, and dialing in the saddle height. With all this rain, it might be done soon! 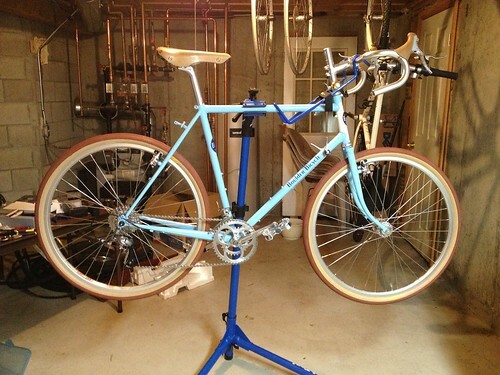 I’ll still have a few things to finish: fenders, lighting, and handlebar tape. And once I get the bar height adjusted, the steerer can be cut to length.